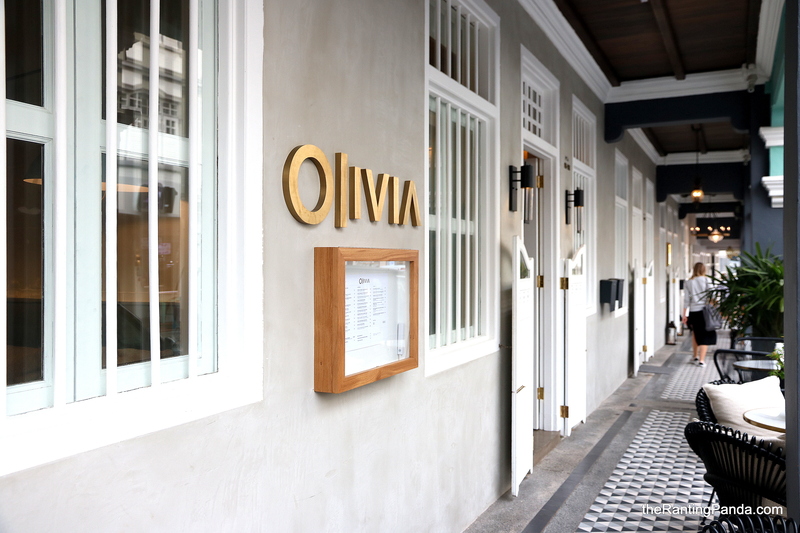 The Place Located along Keong Saik Road, Olivia Restaurant & Lounge is a relatively new Barcelona restaurant housed within the gorgeous space of KeSa House. KeSa House is a lifestyle concept which took over the space of a previous hotel, where restaurants such as The Guild and Pasta Bar are also located in. Olivia is run by Chef and Co-founder Alain Devahive, previously from the team at the now-defunct Catalunya, named after Chef Alain’s daughter. The space of the restaurant is charming, that was my first impression. There is an open kitchen which makes the ambience slightly more casual, with various dining sections to cater to different group sizes. I like the choice of wooden ceilings and the natural arches from the design of the building, which also make the space more homely to dine in. The Food The extensive menu is split into bar bites, starters and mains, featuring a mix of dishes commonly found in Barcelona, with a mix of influences such as Mediterranean and European elements as well. I started with the Mushroom and Truffle Croquettes (S$7), where two servings is really not enough. Served piping hot, the crispy texture of the croquette holds the creamy mushroom, which is delicious along with a tinge of truffle flavour. This is an excellent start for the meal. The other bar bite I highly recommend is the Iberico Ham, Cheese and Truffle Bikini (S$12). I actually recall having a similar dish like this at Catalunya previously and was excited to rekindle my love for the bikini sandwich again. The cheesy element is prepared with blended mozzarella cheese, and it goes perfectly with the Jamon Iberico ham. An important aspect here which makes the dish work is the crispy texture of the sandwich. A dish which I wouldn’t usually order myself is the Confit Piquillo Peppers (S$10), but I am glad I had it eventually after the recommendation from the staff. Piquillo Pepper is a type of chilli from Spain, and this is confit in a way which makes the dish very pleasant to have. And if you are wondering, it is not at all spicy but rather savoury. Moving on for the starters section, the Beef, Foie Gras Carpaccio with Truffle Dressing (S$32) is delicious. The thinly sliced beef comes with a bowl of bread where you can have it together. While the combination of ingredients sound heavy on the palate, it is actually quite well-balanced, especially with small bits of orange peel around the beef which gives it a nice and contrasting zest. If you love beef and cheese, I would recommend the Roasted Meat Canelon with Parmesan Cream (S$24), where you get tender beef cheek wrapped in cream cheese. As expected, this dish is quite strong in flavour, but I enjoyed every bit of it, especially the parmesan cream. The last starter I had is the Black Rice with Carabinero Prawn (S$30). The rice is supposed to be paired with Grilled Calamari, but the kitchen is still trying to source a suitable squid hence I had the Carabinero Prawn instead. The rice here is cooked with squid ink, with a creamy and rich texture and flavour. The prawn is very fresh, though the dish is also slightly on the salty spectrum. For mains, I tried the Ibiza Style Fish & Seafood Stew (S$38), which probably goes even better with some bread if you are still up for it. This hearty and creamy stew is served with clams and monkfish, which is usually the type of fish served for this stew. The freshness of the sea is evident, though I didn’t have much space for the potatoes in the stew. The last savoury dish I had was the Angus Beef Cheek in Wine Ragout with Mash Potato (S$48). This dish is one of the least surprising me for in terms of flavour. The beef cheek is expectedly tender, and the overall flavour is good, though my advice is to skip this and save space for the other more interesting dishes above. For desserts, you have to order the Olivia’s Creamy Homemade Cheesecake (S$14). There are a few types of cheese invoiced here, with just that right amount of blue cheese which adds to the icing on the cake in a very pleasant way even for a non-blue cheese person like me. The texture is soft, while the flavour is creamy and the winning point for me is the perfect combination of cheese here. Divine. If you still have space, the Warm Chocolate Foam (S$8) is a safe bet for any chocolate lover. This is quite an intense yet satisfying dose of cocoa, be warned. Rants Spanish or Barcelona food? The lines may be blurred for some diners. In addition, the flavour of the dishes here lean towards the heavy spectrum, where certain dishes like the Black Rice may come across as salty for some. Will I Return Again? It is a great dining experience at Olivia for me to say the least. I like the robust flavours of the dishes, as well as the dining ambience which is made casual by the welcoming interior. There is not much gimmicks in the dishes, but the flavours speak for itself. This is already one of my favourite new restaurants this year. Make your reservations instantly at Olivia Restaurant & Lounge here.